With the rise of globalization of food trade, the upsurge of wealth and spending power result to greater consumer demand and a change in diets require more variety and nutritious food at affordable prices. 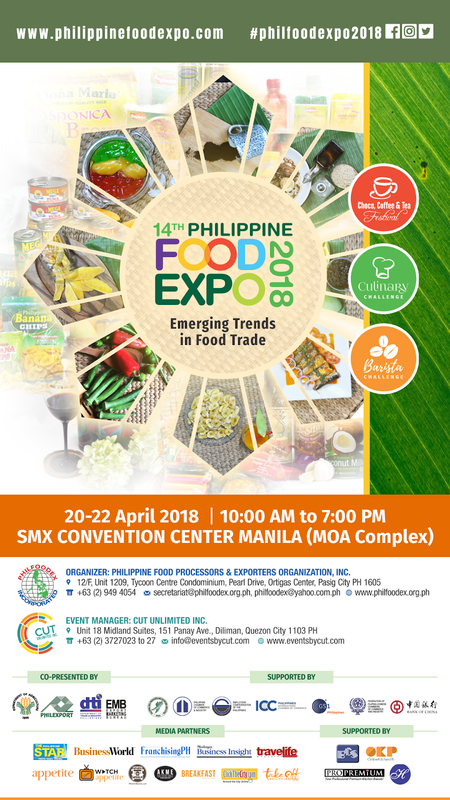 This year's 14th Philippine Food Expo with the theme “Emerging Trends in Food Trade” is scheduled on April 20 to 22 at the SMX Convention Center, Pasay City, Manila, Philippines. The event would highlight the changes in the food industry that allow companies to adapt to market demands, identify suppliers and partners, and to get to know the Philippine food industry and acquire practices and technologies that will help them become more competitive. The Philippine Food Processors and Exporters Organization (Philfoodex) Inc., will lead the way, through the Philippine Food Expo, of ensuring that its member companies and exhibiting participants will be exposed to the various opportunities, as well as challenges, that the upcoming ASEAN Economic Community might present. The PHILIPPINE FOOD EXPO is a must-visit event for everyone, from the everyday Filipino consumer to international traders and importers of food products. Aside over 300 companies composed of local food manufacturers, growers and exporters, equipment companies and ingredients and additives companies, there are food industry-specific seminars, cooking demos and culinary competitions open to everyone. 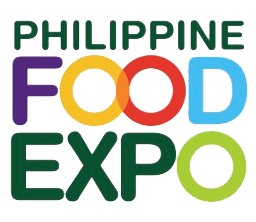 The Philippine Food Expo is organized by the Philippine Food Processors and Exporters Organization (Philfoodex) Inc. and is co-organized by the Philippine Exporters Federation (Philexport), the Deparment of Agriculture, the Department of Trade and Industry and the Export Marketing Bureau. The event is also supported by Philippine Okra Producers & Exporters Association, Philippine Mango Exporters Foundation Inc., the Philippine Chamber of Commerce and Industry, and the Employers’ Confederation of the Philippines, National Food Authority with Media Partners, The Philippine Star, BusinessWorld, Franching PH, Appetite, Malaya Business Insight, Breakfast Magazine, Travelife, ClickTheCity, WhenInManila.com and Take Off Philippines. For more information on the 14th Philippine Food Expo, contact Tel (632) 949 4054 or Email at philfoodex.inc@gmail.com. Cut Unlimited Inc., Event Manager, may be reached through (632) 3727023-25 or email info@eventsbycut.com, or you may visit their website www.phillippinefoodexpo.com.